The Porsche 918 Spyder relies on a 500-horsepower V8 engine and electric drive-systems allowing the vehicle to go up to 25 kilometers on electric power. 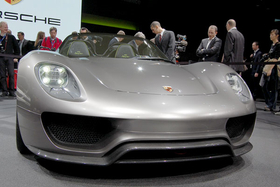 BERLIN (Bloomberg) -- Porsche AG said it has almost 900 potential buyers for its 918 Spyder hybrid prototype as the manufacturer moves toward approving production of the vehicle. Porsche, which unveiled the 918 Spyder at the Geneva auto show last month, will probably decide to build the model once 1,000 potential customers have pledged interest, Porsche's development chief, Wolfgang Duerheimer, said in an interview at the Beijing auto show. Porsche, based in Stuttgart, Germany, plans to add models with a goal of doubling yearly sales to as many as 150,000 vehicles over the medium term, and benefit from savings from a merger with Volkswagen AG. The two carmakers will conclude their talks on a future model strategy and sharing platforms in about six months, Duerheimer said. “We're very optimistic that we'll be able to further expand our leading position in the sports-car segment,” he said. The 918 Spyder, one of three hybrid models Porsche presented in Geneva, relies on a 500-horsepower V8 engine and electric drive-systems allowing the vehicle to go up to 25 kilometers on electric power. The two-seater limits gasoline consumption to three liters per 100 kilometers, emitting 70 grams of carbon dioxide per kilometer. Porsche expects sales in China, its third-biggest market after the U.S. and Germany, to “clearly exceed” 10,000 vehicles this year, compared with 9,900 in 2009, Duerheimer said. The new generation of the Cayenne SUV, Porsche's best- selling model, has “very good” prospects in China and order books for the Panamera sedan are “well stocked,” he said. Porsche aims to double its Chinese dealerships by 2012 to more than 50 from 27 currently, he said. “We expect that the desire for motorization in China will continue unabated,” Duerheimer said.